I spoke with Anthony Parente on Fordham's Entrepreneurship Society Executive Board to learn more about the group. Parente is currently a finalist in the Changemaker Challenge. Previously, he won the Net Impact Mobility Challenge and the How to Change the World: Business Proposal Competition. Please tell me about the Entrepreneurship Society at Fordham. We are a group of aspiring and experienced entrepreneurs at Fordham University, who meet monthly to attend workshops, networking events, and speaker series aiming to develop skills for real-life innovation. Every year we host a conference - we have brought in the founders of businesses, such as Spoon University, Do Something Inc., and Change.org. We have also ventured out on a few NYC startup site visits this year, visiting Uber and Squarespace, where we were given tours of the offices and Q&A sessions with the companies' founding members. 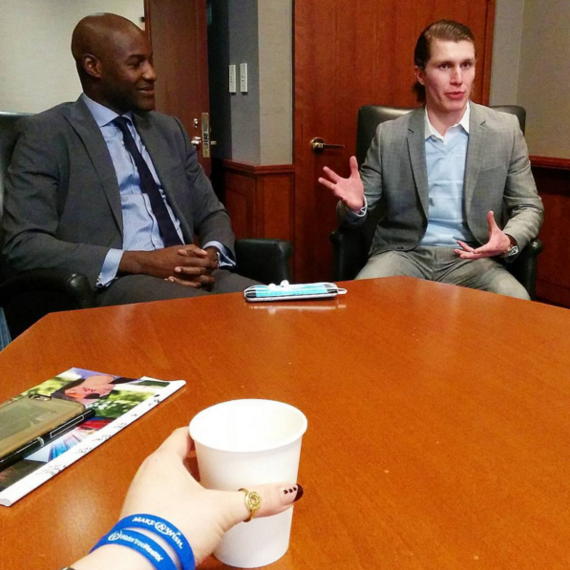 How is entrepreneurship at Fordham different from those at other schools? One big difference between Fordham and other schools' entrepreneurial programs is that it does not have as much funding as NYU's Entrepreneurial Institute does. Fordham's team attracted amazing keynote speakers and 500 guests, but the event was much smaller by comparison. Where Fordham excels beyond most schools is its dedication to the development of socially-beneficial organizations. Compass Fellowship at Fordham is a one-year program that identifies first-year undergraduate entrepreneurs and inspires them to launch socially-conscious ventures. Do you have any plans to collaborate with other schools? As of right now, there are no official plans to collaborate with other schools in the development of entrepreneurial programs. However, students at Fordham are always encouraged to participate in other schools' events, as well as to invite students from other schools to participate in the events held at Fordham. There is a Social Innovation newsletter sent out weekly to Fordham students raising awareness about different innovation and entrepreneurial opportunities and events held on campus and at other schools and institutions around NYC. Personally, I am working on developing a business with a student who is not attending Fordham University. As an entrepreneur, I believe you cannot always rely on some structure that will provide you with all your necessities and resources; you must go out and search for what you need. 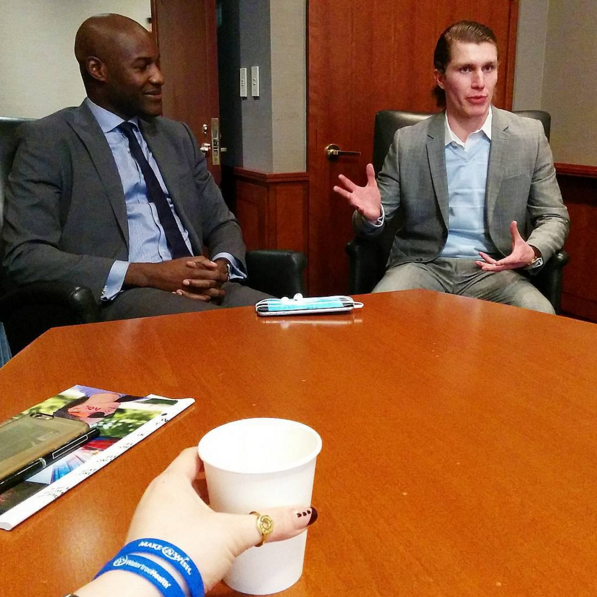 Meeting people and developing a professional network is crucial for aspiring entrepreneurs. One great thing about being in New York City is that there are tons of Meetups and networking events being held every day, bringing together like-minded and driven people. A good entrepreneur will tap into the resources of the connections s/he has made. 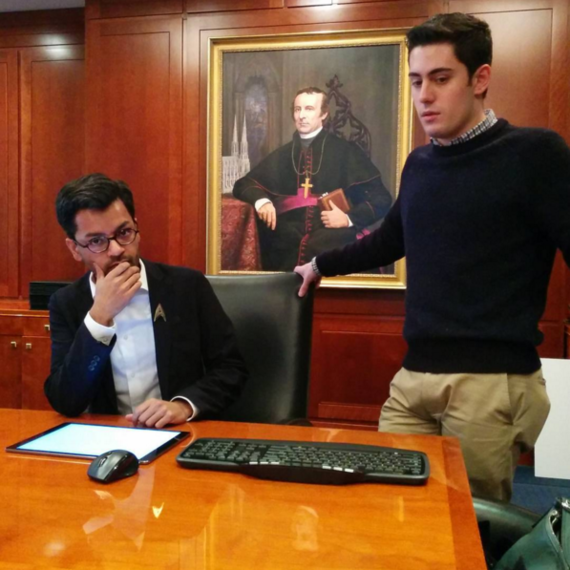 How are the entrepreneurship programs influenced by Fordham's Jesuit mission? Fordham has ingrained its interests toward aiding those who are less fortunate and promoting social justice because of the Jesuit tradition. Social innovation is an intensified discipline at Fordham due to this. All freshman entering the business school this year were required to read How to Change the World by David Bornstein, a book about social enterprises around the world, and to propose their own socially-responsible ventures. Fordham also has a Social Innovation Collaboratory, which aims to raise awareness and capacity for change around big social problems by providing opportunities to implement social innovation and eventually bring positive impact. On April 14th, the Collaboratory held a conference with Make Impact NYC to resolve hunger in NYC. Go to www.foodrichsummit.org for more information. What are the challenges you see on campus, and what is being done to address them? The one issue for entrepreneurs at Fordham is the lack of technical people involved in our entrepreneurial programs. The computer science department and business programs rarely overlap. Recently, we have been deliberating about a solution to this problem and have concluded that to enable entrepreneurs with ambitions within the tech industry, we must develop a mentorship program with experienced technologists. The Fordham Foundry, our on-campus business incubator, is in the works to gather a team of mentors that will be assigned to assist in student ventures. The Gabelli School of Business is now offering a class on how to write apps to further enable execution of their visions. What kinds of projects have students and alumni worked on? There are companies like Concourse Group and Vault Collective, who aim to provide consulting opportunities to clients in NYC. Spire & Co., started by Emily Raleigh, is a remarkable online resource for young women providing editorial content and newsletters, as well as networking opportunities. Pumpstash, started by Corinne Logan, is a company that came out of the Foundry -- it makes spandex for women that hold insulin pumps in discreet locations. Gojimjo and SpareChange are mobile app companies. Gojimgo provides real-time usage data about shared equipment to notify users of the machines' availability. SpareChange helps diners round up their food bills and donate the difference to a charity that provides meals to the hungry. The Fordham Foundry website has a directory with more businesses that are student and alumni operated. How has your experience at Fordham changed you as an entrepreneur? My experience at Fordham has been impacted greatly by the core curriculum, which gives students an ample amount of exposure to different disciplines - it allows us to cultivate a well-rounded skill set essential for entrepreneurs. Through the Fordham Foundry, I was given the opportunity to work with proven and experienced entrepreneurs as coaches. It's great to have them as a resource, as they have practical experience in starting businesses. The Foundry is heavily focused on entrepreneurs' personal and business development; they know how to guide and challenge young entrepreneurs, keeping them on task. Fordham provided me with a free IP lawyer to do a patent search for one of my ideas, and after realizing that the prototype I built was unmonetizable The Foundry advised me to drop the idea. I ended up transitioning from developing on a safety feature for smart cars to now working on a business that aims to develop next-generation features for smartwatches. It was hard to let go, but was absolutely the right decision. In fact, I just met with a venture capitalist to discuss this business. How did the coalition with NASDAQ's Entrepreneurial Center come about and what does it entail? Dean Rapaccioli and the Director of the NASDAQ Entrepreneurial Center, Nicola Corzine sparked a relationship over a recent Fordham-hosted dinner in Silicon Valley. 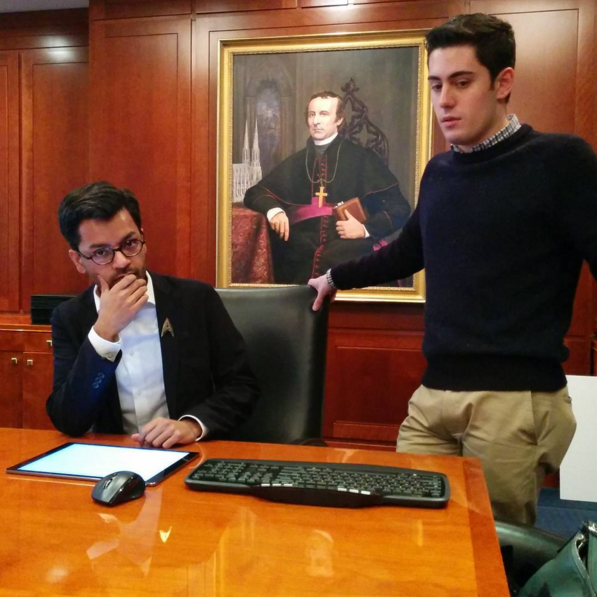 The NASDAQ team was drawn to Fordham because of our growing entrepreneurship program which emphasizes social entrepreneurship and our Jesuit values. NASDAQ is interested in doing a variety of projects with us including intensive programs and research on social entrepreneurship. This semester Professor Christine Janssen organized a course on the tech startup ecosystem. During spring break, we spent a week in Silicon Valley visiting accelerators and startup companies' offices, attending workshops at NASDAQ's Entrepreneurial Center, meeting with VC's (visited Tim Draper and Draper University), and attending a talk with John Chambers (Former-CEO of CISCO).